Listen to the audiobook that V. E. Schwab called "A clever fusion of magic and sci-fi. I was hooked from page one." That was delightful! High adventure spanning the galaxy, set in a reality where magic and tech flow onto one another. The landscape is vivid, the cast complex and snarky, and the stakes high. The narration is great, too! This is my kind of book. Can’t wait for the next one! This space opera takes off from the first minute and never slows down. Great characters, realistic relationships, intense action, and a well thought out ending make for a great listen. Don't miss out on this one. The story took awhile to really get going and, as other reviewers have said, even longer before the two main characters became likeable. Ms. Blacklock, though, did not do a great job as the narrator. She read clearly and rapidly enough, but she failed to establish different voices and accents for most of the characters, male and female alike. Nyla, in particular, was clearly intended by the author (based upon her phrases and words) to have a British accent, but as Ms. Blacklock completely missed that, Nyla just ends up sounding like an American who happens to call people "mate" and pepper her speech with incongruous Britishisms. I will admit that I am only on chapter 4 as I type this. But, this does not in anyway stop me from loving this book so much! The setting is out of this world quite literally, but with a twist I will not ruin here. Amazing world building that makes me want to read more just on that alone. But then you meet our great cast of characters and it just makes the need to read more worse! Also I want to give kudos to the narrator as well. She of course does the characters great, but her action scene narration just nails it as well. Great book, can't wait for more!! The narration is flat, but the story itself is amazing. Don't let poor casting color your opinion of the plot. I hoped- made it all the way through- it just didn't get better. There is an LGBT relationship that was done quite well - not overdone, as many heterosexual relationships are portrayed. None of this could make it more interesting. This series tried to mix technology and magic- frankly, it is un-necessary for a science fiction story. To take from Arthur C. Clarke: "Any sufficiently advanced technology is indistinguishable from magic" The Magic in this story just seems like a shortcut to avoid trying to deal with the "science" part of science fiction. Avoiding a spoiler- there is a plot point that does take advantage of the "magical" aspects- still doesn't seem strong enough. There was some exciting potential in the beginning as racing was included, but that aspect of the character and story potential was mostly neglected. The narrator tried- wasn't great, and could not make something from otherwise weak source material (such as the awesome Ray Porter)- though I see potential in her performance. If magic and science fiction appeals to you, this may be an attractive story. Otherwise, this is a story to avoid. I feel like Cold Forge was a much better use of the author's talent. Still prduction and voice talent were top notch. great characters, and a really interesting story. White nailed the world building. I would reccomend to anyone who enjoys scifi, and especially if you liked Firefly. I loved the non stop action and the mix of magic into the universe. The author did a wonderful job of making magic both potent and arcane at the same time, with power and limits. Also, I found the main characters, all women, fascinating, especially their forceful dialog. 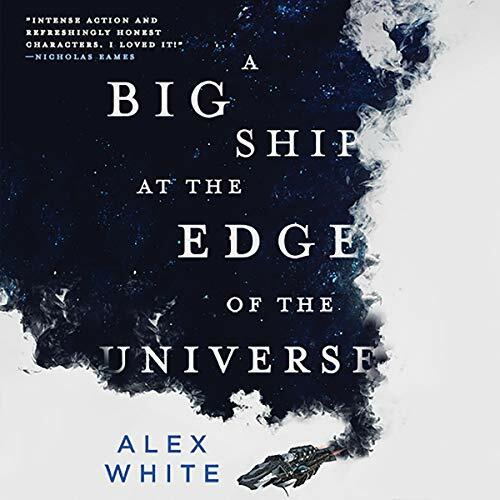 This book had a great plot, a villain named Mother, space battles, a love story, racing, unusual food, all delivered as if it's the natural order of stories. I can't wait for the 2nd book in the series to be published on Audible.